In praise of PINK Peeps. In praise of Easter Peeps, please allow Gadora a little sugary sentiment. Not at all suggesting you decorate with Peeps, but I have them on the brain. This weekend Gadora is gonna tap into her inner rec Roller Girl with some very outwardly displays of Derby shenanigans when my PINK team (deeming ourselves THE PEEPS) takes OUT the GREEN team (Magically Delicious. Blech!) in our first open-door bout. Open-door = spectators. While I’ve been trying to come up with my name-for-the-day: The PEEPinator? PEEP-in Tom? SerenPEEPity? You got one for me? Hopping on my bout-fit (a lil wink to Killer Crouton here! 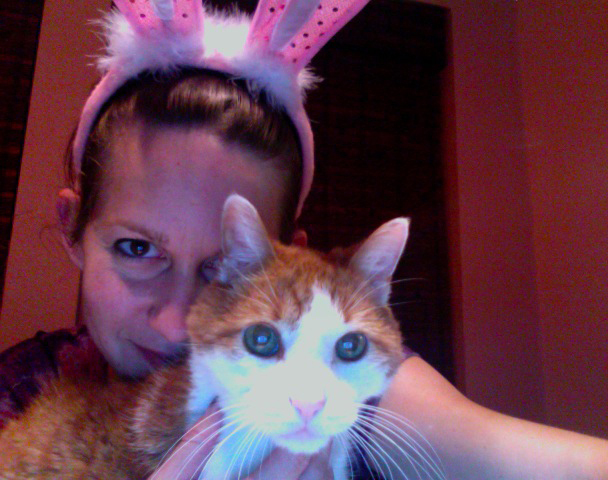 ), Gadora has procured a pair of bunny ears, and may even don a cotton-tail. Yes, I’m getting ready, folks. And I WILL do the bunny hop. In skates. There’s been some friendly-ish banter between the teams, but it’s gonna be seeeerious on Sunday. Trying to rile us up with a little Peep-aganda, The Green Team sent us a Peep show… this all you got? And they forwarded the “melting PEEP in a microwave” video. We are not ruffled, ladies. Not. At. All. THIS is HOW it’s GOING TO GO DOWN Green team. We’ll be turning up the heat! Yeah Green Team, the Peep Train is gonna roll YOU over. And it’s going to be so SWEET! Peeps, Peeps all over the place..
Washington Post ~ The finalists for the 3rd annual Peep diorama. Peep Show III ~ And the winner is: Melissa Harvey of Arlington, Va.
Peepy Links ~ Quite possibly the most PEEP-tastic collection of PEEPS in cyber space. Posted on March 10, 2010 March 11, 2010 by gadorawilderPosted in MusingsTagged Easter, Marshmellow Peeps, Peeps, Roller Derby. Love the site. i have added it to my bookmarks. Have you ever considered adding advertising? I enjoyed seeing the Washington Post! I love #29 PEEP-E! Good luck this weekend.